Welcome to RolexMagazine.com...Home of Jake's Rolex World Magazine..Optimized for iPad and iPhone: Ayo & Teo "Rolex"
Rolex popularity is spreading like wildfire this summer—all over the world—in a most unexpected way! Rolex brand familiarity is rapidly expanding, especially with young kids, through a highly infectious dance song which has very quickly gone viral, and the song, which is responsible for this social phenomenon is simply named: "ROLEX". Ayo and Teo are brothers, and their viral hit song "ROLEX" video which is located below, has already had more than 130 Million collective views on YouTube, and it just came out a month ago!?!! Ayo and Teo's song is going crazy viral on Twitter with their #RolexChallenge, and is appearing in Vine videos, and all over social media video footage. An example of this urban phenomenon can me seen in a tribute to Stephen Curry's NBA Championship winning video below. 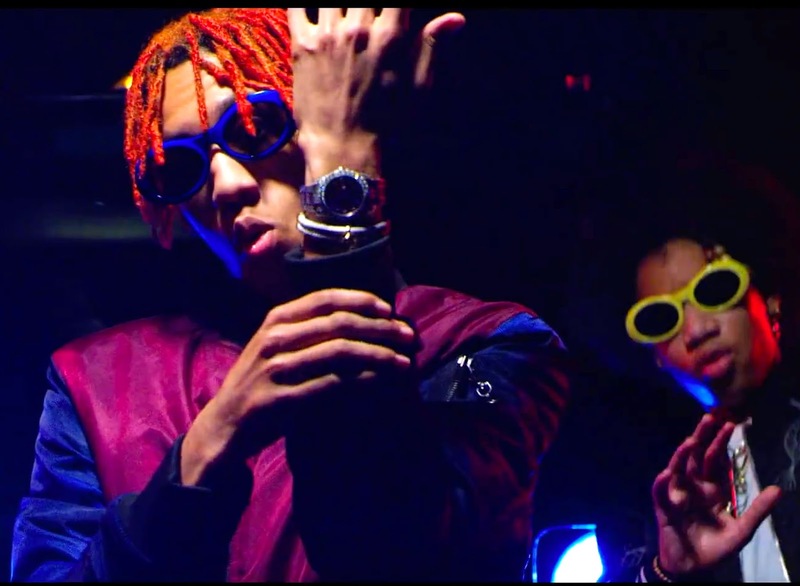 In other words, the Stephen Curry video really has NOTHING to do with Rolex, but somebody put Ayo & Teo's "ROLEX" soundtrack playing in the background as an infectious upbeat anthem, and it has already had over 1.5 Million view. This should not be surprising as Stephen Curry just became one of the highest paid athletes in history, as he just signed a 5 year contract extension with the Golden State Warriors for $220 Million!!! 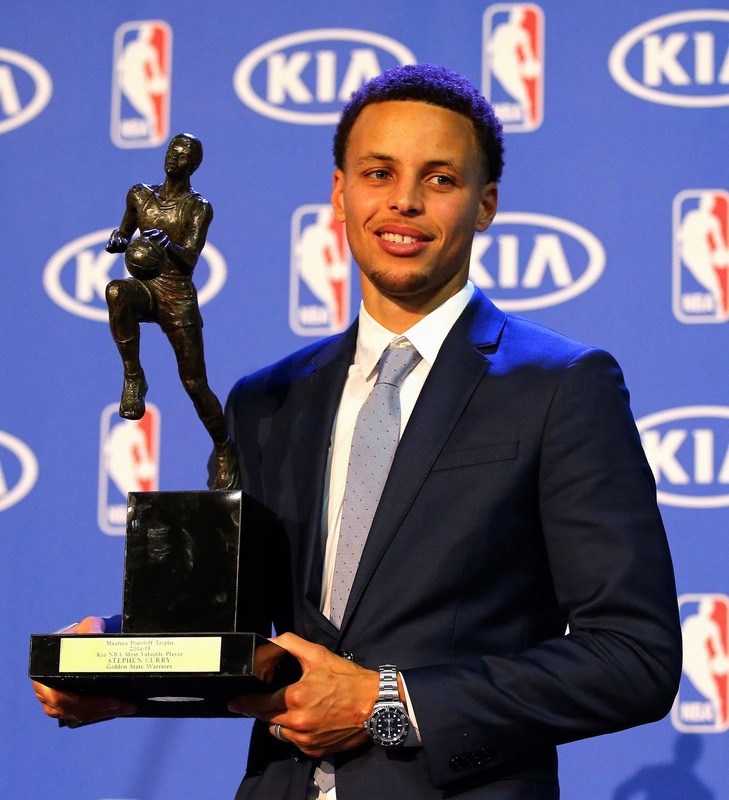 Of course, it doesn't hurt that this years NBA Champion Stephen Curry does wear a Rolex DEEP-SEA SEA-DWELLER as seen in the photo below, which appears courtesy of USA Today. So just to be crystal-clear, despite the fact Stephen Curry happens to wear a Rolex in real life, he is NOT an official Rolex brand ambassador, and the "ROLEX" playing as a themed upbeat soundtrack in the video has nothing to do with the fact he wears a Rolex in real life. The only other anthem, I can think of in history that has had a popularity impact like Ayo & Teo's "ROLEX" song is Queen's, "We Will Rock You." The most recent super-catchy, viral song I can think of was released around this time of year in 2012 was PSY's 'Gangham Style' mega-hit. It's worth noting Ganham Style cultural phenomenon to date has had close to 3 Billion Plays on YouTube. People all over the web have been adding the "ROLEX" song as a soundtrack on random videos, which is acting as a highly infectious upbeat anthem phenomenon for achievement, as seen again in the video below for Odell Beckham. 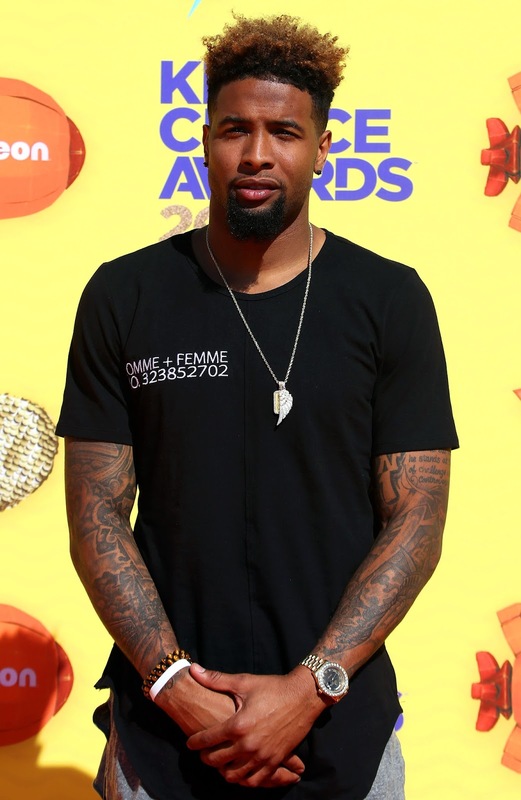 Odell Beckham is pictured below sporting his yellow gold Rolex Day-Date with a black dial and blinged-out diamond bezel. 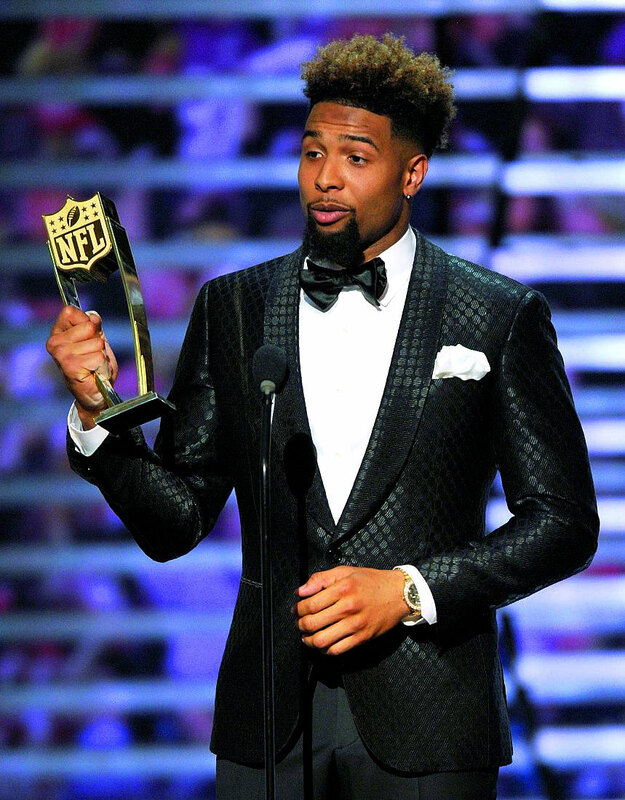 To the best of my knowledge, Odell Beckham is NOT a Rolex brand ambassador either. This "ROLEX" anthem phenomenon is not just limited to the USA, but is spreading all over the world, including to Europe, as witnessed by this Cristiano Ronaldo 2017 compilation video. There are many more videos on YouTube that have Ayo & Teo's "ROLEX" as a soundtrack. It's ironic the three videos I chose that feature professional athletes in videos that feature Ayo & Teo's "ROLEX" song, all happen to wear Rolex in real life, as we see below with Cristiano Ronaldo wearing his two-tone Rolex Submariner. This really comes as no surprise, as it stands testament to the fact Rolex remains The International Mark of Success. 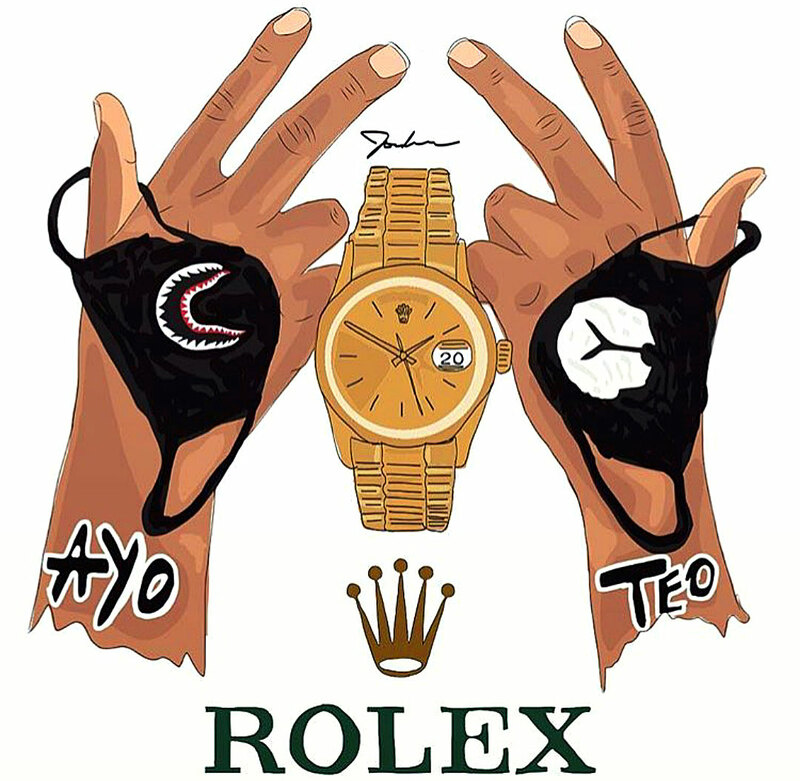 Ayo & Teo's Twitter Handle #RolexChallenge is seen in the video below where Ayo & Teo teach viewers and break-down the different dance moves in their song, "ROLEX". It will be very interesting, years from now to see how successful Ayo & Teo's "ROLEX" song ends-up becoming. I would say, so far it has maintained an amazingly successful trajectory, and seems to be having a profoundly positive impact on people. Rolex is going stronger than ever as being The International Mark Of Success!!! 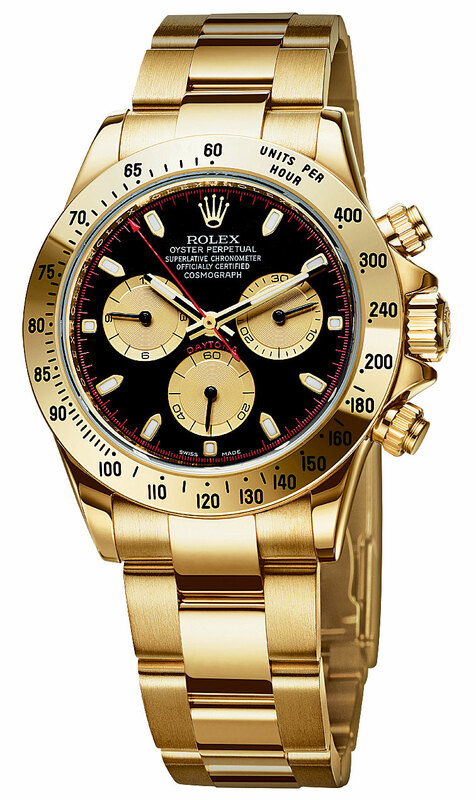 The yellow gold Rolex Daytona Usher is wearing in the video above, is pictured below. Usher's Daytona features an interesting red micro minute track, that matches the RED DAYTONA dial designation. So what exactly is Rolex Ice? Rolex has a long history of bejeweling certain watches. When I toured all four of the Rolex factories in Switzerland back in 2013, I had the opportunity to tour the Rolex department in Geneva, Switzerland that specializes in Gem Setting, and it completely blew my mind!!!! Watching the professional Rolex Gem Setting Artisans working on setting stones was a magnificent sight to see!!! So what exactly is "Rolex ICE"? In the early 2010s, Rolex made an Ultimate ICE Rolex which appears below, and is referred to as a Rolex GMT-ICEMASTER. The Rolex ICE-MASTER is a really, really rare watch, that holds the distinction of being the most expensive Rolex ever offered for sale, at a retail price of close to $600,000. The photo above and below appear courtesy of Robert Maron, and show the Rolex GMT-MASTER [Model Reference 116769TBR], which was made from 18KT White Gold, and was sugar coated with diamonds. The case alone had more than 240 diamonds, and the bezel had 45 baguette cut diamonds, along with three triangular diamonds. Keep in mind, these are not low or medium quality diamonds. Rolex only uses super high-quality precious stones in their bejeweled watches. I used to really dislike Rolex watches that had a lot of bling, until I had the opportunity to play around with some of them at a Rolex AD, and I was stunned with how amazing the quality was! So if I was a zillionaire, and could have a huge harem of watches, would I own and occasionally wear watches like this, just for the hell of it? Sure!!! Why, not!?!! I believe I am in the majority on this one; I think most men prefer the simplicity of simple, low-key stainless steel Rolex sport watches. Don't get me wrong, I like and have owned gold Rolex's in the past, but these days I prefer wearing a simple all stainless steel watch like the Rolex Single-RED SEA-DWELLER. 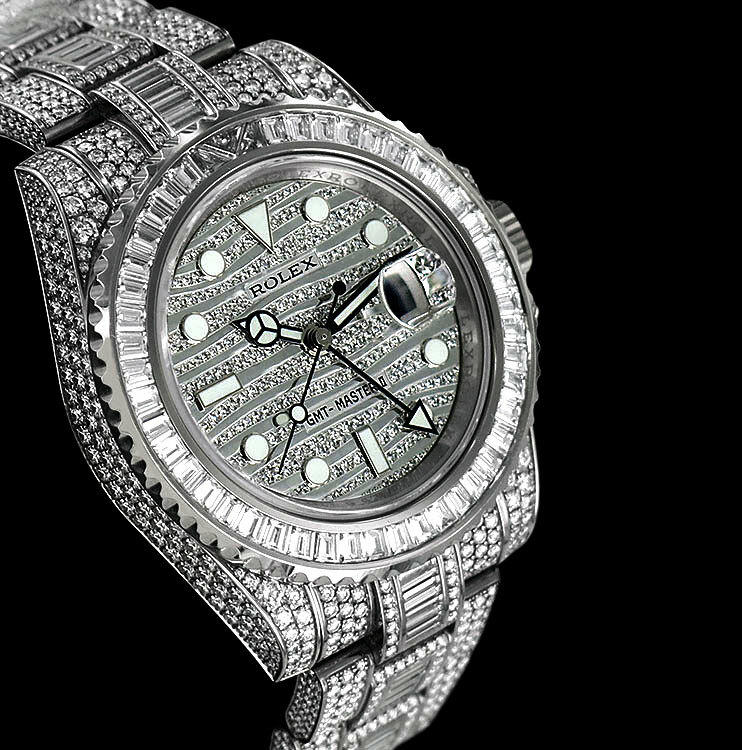 So who do these blinged-out Rolex ICE watches appeal to? They are very popular with chic women, fashionistas and super-leggy-models with a lot of money, who perceive the watches as beautiful jewelry, which is what they are. Also, many inner-city kids aspire toward these watches, like Ayo & Teo, as they perceive them as ultimate status symbols of wealth and prestige. I have also noticed many professional NBA Basketball players, Boxers, and NFL Football Players love wearing blinged-out Rolex watches, as they really set them apart and distinguish them. Also, they are very popular in many countries in the Middle East, where wealthy men want to distinguish and differentiate themselves, and wear something different that shows their wealth and prestige. Many people discount people who wear Rolex watches that are covered with precious stones. Back in the 1980s, when Rolex really became the status symbol it is today, there were many people who would wear Rolex watches that had aftermarket dials and bezels that had been customized with precious stones. I remember that many people seemed to have a distain for these watches and thought they were an overly-opulent, ostentatious, tacky symbols that distinguished the wearer as being nouveau riche (New Money). The truth is that Rolex watches, just like jewelry in general can be polarizing, in the sense that one man's meat is another man's poison. 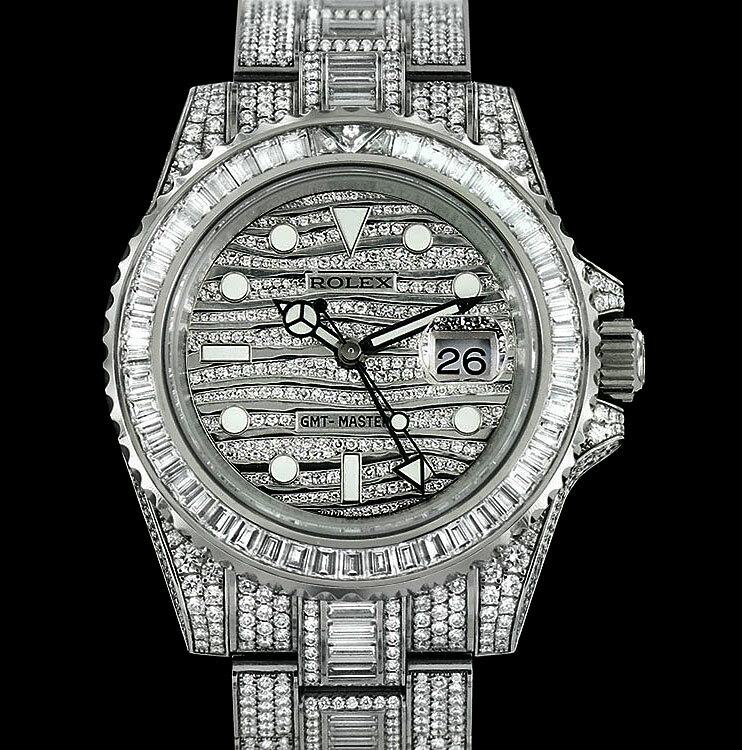 I forgot to mention, bejeweled Rolex watches are also popular with Rappers. Now that I think about it, they are Rolex ICE watches are REALLY Popular with Rappers. Once again, I think it is an inner-city thing, were having a bejeweled Rolex is the ultimate status symbol, which is really what Ayo & Teo are singing about.